What Does GCW Provide on the River? 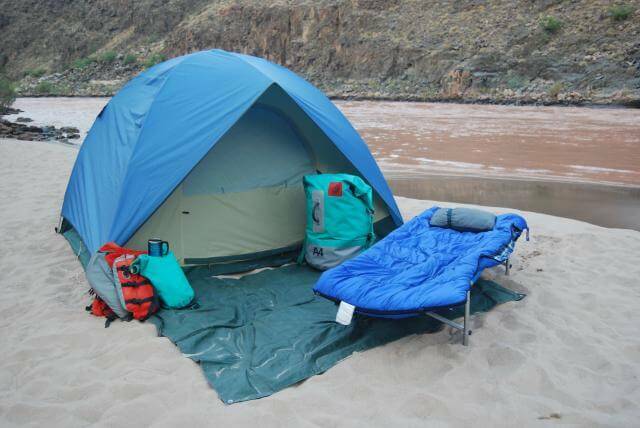 Some of the provided gear for your river trip. Rafting equipment including life jackets: So what does that mean we don’t provide, and you don’t need? Helmets, primarily. Call us if you have questions about this, but the short answer is, they just aren’t necessary on our trips. Large and small dry bags: This one is pretty straightforward. We’ll issue your dry bags at the launch point, which is where you will place your gear into our bags. Camping gear: The tents are 2-person tents (Although, technically, you can fit three people to a tent. And, even more importantly, we don’t recommend using a tent unless it is actively raining. They, like all tents, tend to get stuffy. And they block your view of the amazing night sky.) and, no, we don’t ever assign sleeping quarters. Cots are provided on our motorized trips and sleeping pads are provided on our oar-powered trips. We pack warmer sleeping bags and fleece liners in the cooler times of the year. The pillows are small camp pillows, but pretty darn comfortable. Meals: If you have special dietary requirements or allergies, tell us. We’ll let you know what we can do and what we can’t do. Beverages- One thing to note here is that we cannot provide alcohol … but you can bring your own or if you are hiking into the canyon to start your river trip use our handy online beverage order form (located in your trip information packet) and we will get it on the boats for you. Camp chairs, eating utensils and a souvenir mug: Yep. We’ve got those. Still got questions about any of this? Give us a call!